Grand Opening Special: $88 monthly. That's a $31 discount from the regular price. 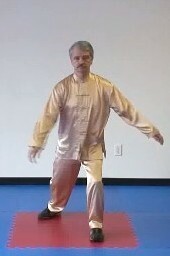 If you've ever been curious to learn more about the unique benefits of Tai Chi, you can experience it for yourself NOW. Classes are taught Tuesdays and Thursdays, 6:30pm to 7:30pm, in Kannapolis, NC. All unity movement comes from the earth, is distributed through the legs, directed by the waist and expressed in the hands. 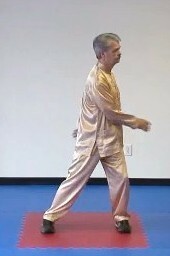 Shifting the weight and turning the waist is the most fundamental movement of all Tai Chi forms. 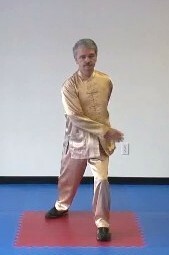 This exercise prepares us for all movement where total unity of the body is required. Stand with the feet about one and one-half the width of your shoulders. 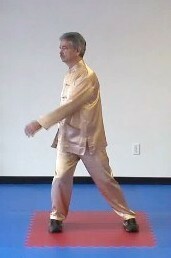 Both feet should be pointed straight ahead. Sink down, bending both knees. 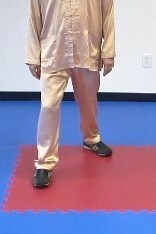 Begin to twist the waist 45 degrees to the left and 45 degrees to the right in a soft, consistent rhythm. 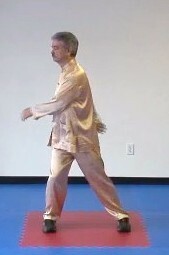 Slowly begin to shift your weight to the left foot as you turn to the left and shift your weight to the right foot as you turn to the right. Allow the arms to hang freely as you shift and spin. Relaxing the shoulders completely will allow the arms to spin around the body in such a way that the hands will touch your body. Shift the weight by softly letting go of the tension in the leg of the direction you wish to shift and turn into. 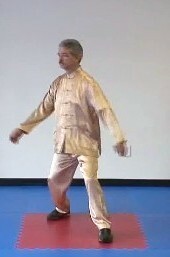 If you are shifting to the left, relax the left leg. 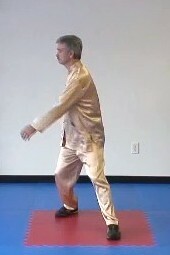 This allows gravity to pull you to the left, rather than you pushing yourself to the left with your right leg. 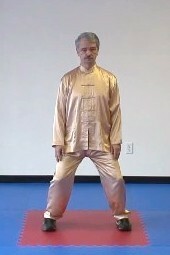 Continue this practice to both sides. 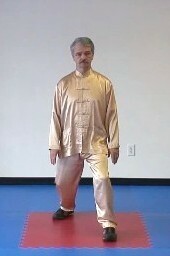 Make sure the head is not moving up and down during the practice and that your feet remain flat to the floor and pointed directly to the front. Following the same procedure as shift and spin side to side, stand in a forward position with 70 % of your weight on the forward foot. The feet should be about the width of your hips; front foot pointed straight to the front and the back foot turned out 45 degrees. LU=3a.m - 5a.m. CO=5a.m. - 7a.m. KD=5p.m. - 7p.m. BL3p.m. - 5p.m. HT=11a.m. - 1p.m SI=1p.m. - 3p.m. SP=9a.m. - 11a.m. ST=7a.m. - 9a.m. · Bounce for 5 to 10 minutes. · Grounding for 3 minutes. Hold “Hugging the Tree” position for five minutes. Gradually increase the amount of time as the weeks pass. The goal after a few months should be to hold the “hugging the tree” position for 20 minutes. 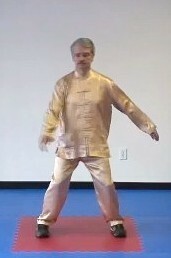 · Tai Chi for the Living Room™ form for 4 to 20 minutes.